This story appears in the May 14, 1979, issue of Sports Illustrated. Subscribe to the magazine here. He was taking the gale head-on now, but at least the stinging rain had stopped and his mind was still working. Keep concentrating, Tom Warren told himself. Still 20 miles to go, most of it into that awful wind, the same gale he had been fighting for 120 miles and almost nine hours. The bass drum in his leg was getting louder, and his head flopped sideways. Up ahead stood a man and his wife, paunchy, middle-aged Hawaiian tourists, watching a spectacle outside their ken. Past the astonished couple the runner stumbled, shirtless, eyes down, concentrating to avoid delusion and shock. Finally the tourist could be quiet no longer. "Go, Iron Man!" he shouted. "Go, Iron Man!" Tom Warren, age 35, shuffled off. Still 20 miles to go. And the others were back there chasing him. The athlete had been stung by a jellyfish and partially blinded by salt water. He had been lost and confused. Physically he was a mess. 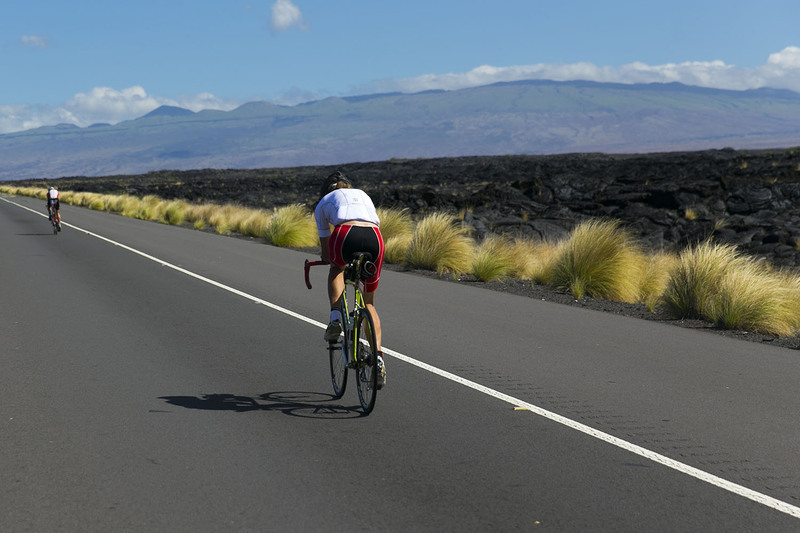 But still he kept on in this, the Hawaiian Iron Man Triathlon, an event that involved swimming 2.4 miles in perilously stormy seas, then bicycling 112 miles around the island of Oahu, followed by a 26.2-mile marathon run. A fellow in a Superman outfit was among the competitors. They all shared a common reason for being there, a very compelling reason (some called it a curse): an addiction to inordinate amounts of exercise. Warren did not want to take leave of his agony and look up at the distracting grandeur of the distant mountains. A man endures torture believing the end will come. On a bet Warren once did 400 sit-ups in a sauna. The man he bet against was to keep count, but he wilted in the intense heat and quit after 300. "You're crazy," he told Warren. Warren did the last 100 alone in the sauna. The prize was a bottle of beer. on the nearby big island of Hawaii. Now the waters off Waikiki boiled and frothed, stirred by winds of 40 miles per hour. A Navy officer of two decades of seagoing experience could not get his boat out of the harbor. That meant there would be only one rescue vessel in seas of four to six feet during the swim from the War Memorial Natatorium to Hilton Channel. The competitors were undeterred. This was a legal way to prove their toughness. Originally 28 people had said they would enter—including three with shaved heads, one of whom wore an earring. Of those only 16 milled about in the early-morning darkness. The sky was black and the wind bent the palm trees. The vote was 13-3 to race. A balking, apprehensive woman entrant wondered why. "Everybody has to make their own decision," yelled a man in a rain slicker, one hand holding the hat on his head. "It's just like life." The woman walked away. She had dropped out of school and trained for a year to be in the contest. Still, she figured her life was worth more than that. 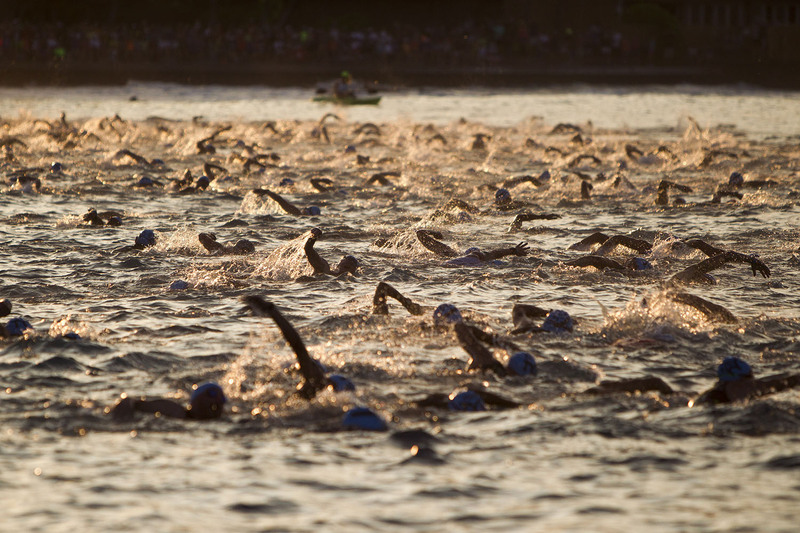 The Iron Man contest was born when someone wondered what would happen if endurance tests in swimming, bicycling and running were piled on one another in a single event. Twelve people finished the 1978 Triathlon. Three did not. One fellow turned delirious and quit. Another inexplicably said that he would run only 14 miles in the marathon. And the third wrecked his bike. He was unhurt, naturally, being an Iron Man, but his fretful father persuaded him to retire. All finishers received five-inch-high trophies made of nuts and bolts, each with a hole in the top, or, you might say, the head. It would seem not much of an award for so great an effort, but the significance of the event is that there is no apparent significance. No prize money is involved, and little fame; last year's winner, bearded Gordon Haller, a 28-year-old retired taxi driver, was delighted to read a short race report in a Honolulu newspaper. Better yet, friends started sending him mail addressed "Iron Man." The 1978 event began as an experiment and included a mixed bunch of casual entrants. One fellow could barely tread water. Another bought a bicycle and learned to ride it the day before the race. In the run, a contestant stopped at McDonald's for a soft drink. The man who won the swim had a bad knee from an old karate injury and needed eight hours to complete the marathon. Organizer John Collins, a Navy commander, did not foresee that Gordon Haller and a college student named John Dunbar would bite the athletic bullet and almost kill themselves in the first contest. Last year Dunbar splashed out of the ocean with a 20-minute lead over Haller. As Haller chased him the rest of the day, Dunbar slowly crumbled. He was not adequately prepared. The night before, he had been up until midnight packing supplies. After the swim he had to borrow cycling shorts for the bicycle ride, and then his support van became lost. Ten miles from the marathon finish, and hallucinating, Dunbar ran out of drinking water and guzzled two cans of beer. Haller caught Dunbar four different times. On the first two occasions Dunbar had stopped to have his legs massaged. The third time he had stopped to urinate. Finally Haller passed Dunbar for good and finished in 11 hours and 46 minutes, running the last five miles in 31 minutes as Dunbar's physiological warning lights flashed and alarm bells sounded. Dunbar's time was 12:20. At the end he was staggering into parked cars and accusing his support-van driver of trying to poison him. That was totally out of character for the 25-year-old Dunbar, a blond, open-faced fellow who is very good-natured and shy around strangers. He ran in a women's race last year wearing a T shirt that read TOKEN. But there is a serious side to Dunbar, and he had seethed ever since his 1978 defeat. When people mime his hardened competitive spirit, they clench their fists and make chomping, biting gestures, evidently comparing him with an implacable snapping turtle. In the Navy Dunbar had been a member of the Seals, an elite underwater demolition group. On ambush training patrols, Seals are not allowed to swat mosquitoes, and during 23 weeks of schooling they are at times in mud all but three hours a day: that is when they sleep. One of the tough parts is log training, when a group of men run with a 300-pound log on their shoulders, shouting, "Kill." Seals are supposed to have the highest divorce rate, as well as dropout rate, in the military, but they think it unfair to them to be considered only as zealots who, on bets, bite heads off chickens or eat glass. They say they are looking for challenges. Dunbar's rival, Haller, also was in the Navy. "The Seals aren't so tough," he says. "There were a few in my unit and I was tougher than they were." Haller grew up in Forest Grove, Ore. as a studious, bashful sort. He took a degree in physics at Pacific University. Since then he has raised a beard, learned to modulate his voice at radio broadcast school, taken a speed-reading course, let his hair grow, studied the power of positive thinking, shed his timid ways and re-sculpted his body on exercise equipment. Around strangers he wears tight T shirts and subtly pops his muscles. Old friends don't recognize him. The revamped Haller finds joy in odd accomplishments; he is, for example, an expert on TV cartoon trivia. Someday he hopes to run cross-country—that is to say, across the entire country, the continental United States. Meanwhile, his average yearly income runs between $4,000 and $5,000. He gave up driving a cab and now repairs roofs. More exercise to be had doing that. Competing is Haller's real profession; he will sign entry blanks the rest of his life. "I'm good at it," he says. "If you've got a talent, don't waste it. Also, I like the feeling of power." During the months preceding the defense of his Iron Man title Haller trained back home in Oregon, running and swimming through fog, cold, rain, ice and snow, and pedaling his bicycle indoors on rollers. He drove 80 miles round trip several times weekly to exercise on Nautilus equipment. He has seen the movie Superman twice. A favorite scene is when the man of steel scans Lois Lane's lungs for cancer. Haller will not date a girl who smokes. He says he is happy. Some people associate times of their lives with popular songs or love affairs. Haller does it with injuries. Thus, 1972 was the year he sprained his ankle four times. And he will never forget 1969. He was sick then for nine months, a siege precipitated by his exaggerated regimen. He was working out three times a day, had two girl friends, was staying up all night to study for exams and was preparing to run the quarter mile and half mile in a track meet. In succession he had mononucleosis, strep throat, hepatitis, dysentery, tonsillitis and trench mouth. His legs became paralyzed. "Then I really got sick," he says. His convulsions were so severe that he suffered a double hernia. "It was a good time to lay back and reflect on life—what was left of it." Haller lost 28 pounds in one week. "At the end of the week, Neil Armstrong walked on the moon and I ate my first meal," he recalls. Haller played the trumpet to ease the boredom of convalescence. Then his face became partially paralyzed. But worse, he felt, was the deterioration of his athletic skills. Frantically he fought against it. "I liked my crutches because they were building up my triceps," he says. Haller sneaked a rubber inner tube under his bedcovers and surreptitiously exercised with it, and, when nobody was home, he slipped outside and ran around the block. His time was 3:12, a minor disappointment. He rested and slept for three days, then did it again in 2:52. There is a big star in Haller's workout log for Jan. 5, 1970, the day the doctors pronounced him cured. Now, on a spooky morning on Oahu, the competitors contemplated the start of this year's Iron Man contest. Ahead were hours promising pain, mental anguish and significant physical danger. John Dunbar arrived at the starting line wearing a Superman costume sewn by the sister of one of his support crew. Also present was "Cowman," 34, a bearded 6' 3" individual weighing 215 pounds who competes in distance runs while wearing "caveman pants" and a buffalo hat made of fake fur with two large cow horns protruding from it. Another fellow had on a football helmet. Haller huddled in a rain jacket. And Tom Warren paced nervously. Warren had arrived as an unknown quantity from San Diego, where he owns a bar called Tug's Tavern. His trip cost $1,000, suggesting he could be just as serious about the event as Gordon Haller or John Dunbar. "Some people would take the $1,000 and buy furniture, but this is something you'll have with you for the rest of your life," Warren said. That may be the essence of this type of contest. In San Francisco there is a man with a curlicued, waxed mustache four feet wide. It has changed a dull life. Writers interview him, and women are fascinated. Crowds part before him, and celebrities ask for his autograph. To Warren, the Iron Man contest does much the same thing. Warren is a blithe, irrepressible imp who speaks in an almost breathless voice, his eyes magnified behind his glasses. He says he does a secret type of sit-up and claims the bad feature of racing is that it interrupts his training routine. "I could never associate racing with pain," he says. "It's like going to school. You have to take exams to find where you stand." On superficial inspection the triumvirate of Warren, Haller and Dunbar might appear to be the same person, one fanatic inhabiting three bodies. However, there are differences. Warren is able to combine a lust for training with the successful operation of his tavern, while Haller would be content never to work another day. Dunbar is somewhere in the middle. Believing that physical conditioning can become a cult activity, he vowed that this Iron Man contest would be his last, win or lose. Commander Collins had postponed the race one day, then had delayed the scheduled 7 a.m. start, afraid not only that someone might drown in the turbulent passage but that during the 112-mile bike segment a sudden squall might unseat a rider. Warren was thinking of the wind, too. He planned to use it to his advantage on the bike leg, figuring he could ride it down the entire back side of the island, using his body as a sail. For this purpose he had installed an unusually high gear on his bike. He hoped to leave the younger fellows like Haller and Dunbar so far behind that they never would recover. With starting time near, German martial music blared from Dunbar's van as he changed from his Superman costume into swim trunks. At the water's edge, Cowman, wearing his horned hat, knelt before the ocean. "How are conditions?" one of the competitors asked a spectator. 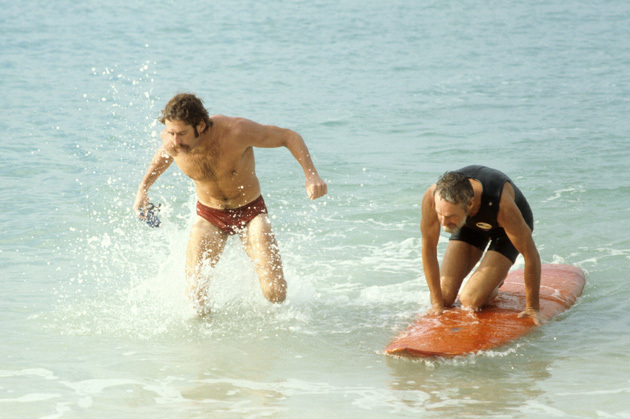 The contest rules stipulated that each swimmer be escorted by a paddler. Finding one certainly would be no problem, since it is assumed that any young able-bodied man in Hawaii can handle himself in water. Well, 40 minutes into the race one of the paddlers had to be rescued. Unfortunately, he was Jamie Neely, Haller's guide. Neely said he was sorry, but he really was afraid for his life. Ocean swimming is not like swimming in a pool, where Haller had trained diligently for 12 months. Last year in calm seas he managed the ocean swim in about 80 minutes. This time he hoped to lop off 20 minutes, improve significantly in the other events and complete the contest in 10 hours or less. In Oregon a few weeks before, he did half a triathlon at a 9:12 overall pace. But now, without a paddler, navigation became as much a problem as the high, cold seas. As Haller zigzagged, trying to stay on course, his strength was being sapped, as if he were swimming in jelly. First out of the ocean was Ian Emberson, a 27-year-old restaurant manager for a Honolulu hotel. His time was 62 minutes and 35 seconds, a pace of 2.3 miles per hour. For comparison, distance swimmer Lynne Cox averaged 2.1 miles per hour on her most recent English Channel (20-mile) swim. Old Tom Warren finished four minutes later. Then in quick succession John Dunbar and Mike Collins, son of the Commander, arrived. The 16-year-old Collins was so debilitated that it would take him 14 1/2 hours to complete the bike ride. Dunbar was thoroughly chilled, his body shaking and his arms and legs flopping about uncontrollably. A tourist looked on worriedly and said, "Doesn't he need rest?" As Dunbar climbed on his bicycle to take after Emberson and Warren, Haller was still hidden somewhere back in the swells of the ocean. , a 27-year-old Bostonian and the only woman competing, emerged at the 76-minute mark. At length the defending champion was sighted, barely moving. Ten yards from shore, in water so shallow he could have stood, he weakly splashed in place. Finally he got up, stumbled and almost fell. "Is that all there is?" he wheezed. His time was 112 minutes. He was in ninth place, about 20 miles behind the cycling leaders. For this he had trained a solid year. There were those who expected Haller to quit, in exasperation if not in exhaustion. Winning seemed no more than a remote possibility. But Haller is convinced he is tougher than a Seal. He showered, changed clothes, swallowed some high-energy liquid nourishment and wobbled off after Warren, Dunbar and the others. Last year the bearded athlete had passed wilting rivals throughout the bike race. Maybe he could do so again. Now was the time to cash in on those days of pain recorded in his training logs. Most of the Iron Man contestants keep precise training diaries. To them they are canceled checks to peruse fondly. Haller logs not only every shred of physical activity, but also each morsel of food and the time it was consumed. Junk food is underlined. He records his pulse rate, his sleeping time, injuries and the quality of the day. Tom Warren not only chronicles his daily exercise but makes copies that he sends each month to friends around the country. Most of them get thrown away; some do not. Fifteen years ago Warren swam for the University of Southern California. He has a standing bet with each year's swim team that he can do more exercise mileage per month than the entire team can do in practice. Coach Peter Daland reads Warren's monthly exercise tallies to the squad. 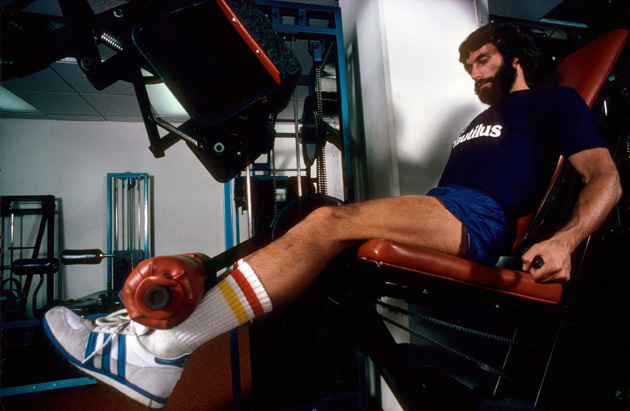 Once Warren rode his bike from San Diego to Los Angeles, rolling onto the Southern Cal campus and into the natatorium to hand-deliver the workout sheet. The swimmers applauded. Opinions differ as to what worthy competition is, what toughness is. To some, it is playing in a Super Bowl—or making enough money to drive a Mercedes-Benz. Last year a television-network president was interviewed at a college basketball game in New York City. Since then he has been replaced, which is perhaps immaterial, but at the time he commented that he was in his office daily at 7 a.m., and ate both lunch and dinner at his desk. He had taken a limousine uptown to see the first half of the basketball game but had to return to the office right after the interview. He usually knocked off around midnight, he said. There were a wife and kids at home. The contest he was competing in may not have been for everyone, but he said he was happy. Among the Iron Man entries was an individual with a master's degree in exercise physiology, another with a degree in accounting, a fellow applying to law school, a research anesthesiologist, the treasurer of a San Francisco leasing company and Haller with his physics degree. Disparate as their backgrounds were, they shared a common bond. Henry Forrest, a Marine stationed in Jacksonville, N.C., had hitched rides on military transport planes to get to Honolulu. Until the 1978 Iron Man Triathlon, he had not ridden a bike since the fourth grade and had become lost during the race. He hoped to improve on his performance this year. People thought his name was Forrester, because when introduced he said rapidly, "Henry Forrest, sir." Pedaling along during the first part of the bike race, Warren reflected that this would be a momentous day. His presence near the lead was surprising. A businessman closing in on middle age, he had less time for training than the unemployed Haller and Dunbar. When Dunbar, disgusted at the event's one-day postponement, had impulsively announced on Saturday that he would challenge Haller to do the course that day--just the two of them, man against man--off to the side stood Warren, unnoticed. No one thought to challenge the saloonkeeper. So Warren went down to a Waikiki bar, drank beer in solitude and watched a week-old television replay of the Hula Bowl. While Haller and Dunbar were with friends, Warren was staying alone in a cut-rate hotel that had black-and-white TV sets with 12-inch screens. After 8 p.m. he couldn't be reached by phone. Warren had not trained in four days. He felt fat. And the weather was getting worse. Reports from the mountains mentioned snow and waterfalls where the water was being blown upward by the fierce wind. That night Warren turned up at dinner with some fans of the Iron Man contest; he was, by and large, ignored. The discussion centered on the merits of Haller and Dunbar, on which of those two had the better chance to win. Eventually Warren spoke up. "I just want to be a factor," he said. In the movie Rocky, Sylvester Stallone, playing a heavyweight challenger, said, "I just want to go the distance." Warren would not contradict the notion that the race would belong to Haller or Dunbar, but he wanted to go the distance, too, to be a factor. Warren has owned his bar in San Diego for 10 years. It is a business not lacking in competition. The record for Thursday-night taco dinners is 1,519. The Sunday breakfast record is 1,003 omelets. One floor of Warren's four-level, $220,000 house is "Tug's Athletic Club." It has a whirlpool bath, a sauna and a weight machine. He also owns apartments and a five-bedroom, 80-year-old house that he and 15 friends once occupied. When he runs on the beach he stops at lifeguard stations to write down business ideas. His grammar isn't perfect, but in his business that is good cash-flow strategy. With all of the entrants, Warren shares the love for competition, but, surprisingly, he hates gambling. "The gratification of winning money isn't as high as the discomfort of losing, therefore the odds are bad," he says. But he will bet on his body. For fun, he even competes over the time he can sit in the whirlpool. "Fat people are tough to beat. Especially women with those little skirts on their swimsuits." Warren remembers when he first realized he was different. There was a boy in his neighborhood, a good swimmer, and the boy's parents urged the youngsters to race. Warren hesitated. The parents insisted. Tom Warren won, and afterward he cried, not because he won, but because he had to win. Lyn Lemaire, the only woman competing, finished fifth. In college he was a good swimmer, but teammates were better. They had been swimming seriously since infancy; he had started organized competitive swimming when he was 16. Warren will not play racquetball anymore and this is why. One regular opponent had beaten him repeatedly. Warren improved and finally won. The other fellow refused to play again. Warren wanted to keep beating him. He has not married; he is afraid he would always be badgering his children to work harder. After a dozen miles of bicycling, Warren caught Emberson on a steep hill overlooking the Pacific, a point where the wind was so bad Warren's support car almost was blown off the road. The Californian bored ahead and broke the other man like a dry stick. Emberson swims five miles a day and carries his ocean gear to work, just in case conditions are conducive to swimming the channel between Oahu and Molokai, a 26-mile trip. But he is not a cyclist and had run only one marathon. As the race developed, the rain stopped and two things became apparent. Warren was holding his lead and he was being chased by a woman. Lyn Lemaire was about 10 minutes behind and matching his pace. Emberson and Dunbar were falling back while Haller, feeling better now, was slowly gaining ground on them all. When Lemaire pedaled past Dunbar, Superman appeared startled, then asked a crew member, "Is she in the race?" Lemaire smugly turned and waved. She holds the American women's cycling record for 25 miles (1:00:6). At 5' 6" and 148 pounds she is not a whole lot smaller than Warren, Dunbar and Haller, who are about 5' 10" and 155 pounds. Going down the length of the island, Dunbar trailed Warren by 15 minutes, then 30. He thought, "When is he going to stop?" Warren, the man who does sit-ups in saunas, was dreaming of cool rides through the evenings back home and thinking, "If I don't stop, nobody can catch me." His eyes watered from saltwater irritation, no big problem; Warren does not feel pain as most people do. He won't allow himself to. Yet his feet are so tender that he has tried running races wearing women's nylon ankle socks to prevent blisters. It didn't help. Warren claimed to be in only mediocre shape, "but sometimes it's more fun that way," which is to say the challenge is greater. Warren's mother, Josephine, comes from an athletic family. His father, George, who died in 1966, was a senior vice president of a savings and loan bank, and had earned a college scholarship by playing the bugle. Tom's brother, Bill, is seven years older and, like his father, not interested in sports. Consequently, Tom grew up tugging at the sleeves of older kids who did not want to be bothered; hence his nickname Tug. The frustrated youth amused himself with solitary games. He set a record by swimming three miles, a total of 500 laps, in the 11-meter family pool. Only he knew it was a record. When racing, he wants the lead so no one can see the pain on his face. As the bicycle race went on, Warren decided that if he stopped because of fatigue, he would act as if he had a flat tire. He knew Dunbar and Haller were back there hoping. , a hair stylist. Warren did not have a backup bike. As the race progressed, his crew's mood ran from initial surprise, to enthusiasm, to awe. Turning back toward Honolulu, Warren's path took him up Route 99, a tortuously steep grade that arrows through pineapple and sugar-cane fields, and directly into the wind. On this stretch Ian Emberson balanced almost motionless, making virtually no forward progress against the gale. Warren began the six-mile climb with a 30-minute lead over Lemaire and a bit more over Dunbar, but the pursuers took an alternate route that was more sheltered and made up great chunks of time. The woman cyclist closed to within five minutes. "Where's the girl?" Warren kept shouting. He started pumping harder. Fighting their way far behind the increasingly concerned leader, Haller and Dunbar hoped that their chance would come in the marathon when Warren finally might collapse. Haller is a fine runner, and Dunbar, in the last year, had improved so much in the marathon that his best time now was two hours and 39 minutes. If he wanted to concentrate on the event and lose 25 pounds, he probably could become world class. In 1977, his final year at Honolulu's Chaminade University, Dunbar lived on campus, sleeping in a van for six months. Now that he had graduated, he was staying in a one-room cottage that rented for $160 a month—nothing much, but a spacious dwelling to someone accustomed to life in a 6' by 15' metal box on wheels. Dunbar planned to apply to law school and to get a job as soon as the contest was over. It had been a long year. During the previous week the normally placid youth had noticed that his pulse rate was up. 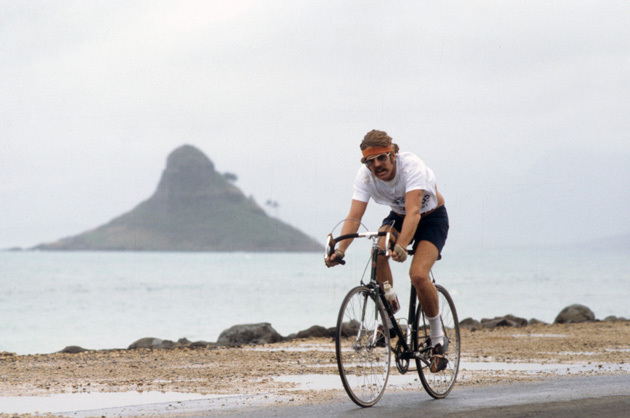 Leader Tom Warren pedaled into downtown Honolulu, hunched over his bicycle, legs churning so hard that his support car was having trouble keeping pace. When he pulled up to the finish line, he discarded his bike, smeared Vascline on his feet and shed his shirt to reveal a back turned scarlet by exertion. A television man stuck a microphone at him. "How do you feel?" he said loudly, like a man yelling down a cave. "I don't feel like dancing," answered Warren. John Dunbar (center) repeated his second-place finish. , finished 11 minutes behind Warren after leg cramps stopped her eight times in the last 10 miles. In the same stretch, Dunbar halted and switched bikes twice because he was uncomfortable on the seat. His eyes were receding, his face drawn and wan, his complexion going fishy. Up ahead, early in his marathon phase, a factor named Tom Warren jogged past Waikiki Beach and down the middle of Kalakaua Avenue, serenely singing the Southern Cal fight song. If he won the contest, Warren planned to purchase a $600 wooden lion. He is amused by such artifacts. His tavern has a mock smokestack and a ship painted on the side of the building. Warren's typical garb is shorts and T shirt. Once in France he noticed that people were whispering. He asked his Parisian girl friend why. "They think you're vulgar," she sniffed. The athlete had been walking to the Seine River in his bathing suit and goggles for a swim. As he ran through downtown Honolulu, dodging in and out of traffic, his back burnished red, no one paid him any heed. About five miles into the marathon Warren knew that Dunbar had passed Lemaire and Emberson but was trailing by almost 30 minutes. The other threat, Haller, was another 30 minutes behind that because of his disastrous swim. Warren was reminded of a friend who for a year told the story of Warren winning a 15-mile lake race. "And he never broke stroke!" the man would say. Now as he plodded dumbly into the wind. Warren knew that the young men behind him could not catch up. "Don't break stroke," he thought over and over. Life's tailings have significance for Tom Warren, who cherishes what most people throw away. Occasionally he will run from San Diego to Tijuana, Mexico. Then when someone asks how far he ran that day, he can shrug and say, "To Tijuana." People are impressed. "You need the incentive," he says. Basically, he is deformed. When he tires, he grows silent, his right leg splays out and his head tilts toward his right shoulder. At 22 months he fell and broke his leg. It itched. Three times he broke off the cast by smashing it against a wall. Finally it was reinforced with steel. The leg healed crookedly. Most times, you cannot tell, but when he is fatigued his body leans grotesquely. 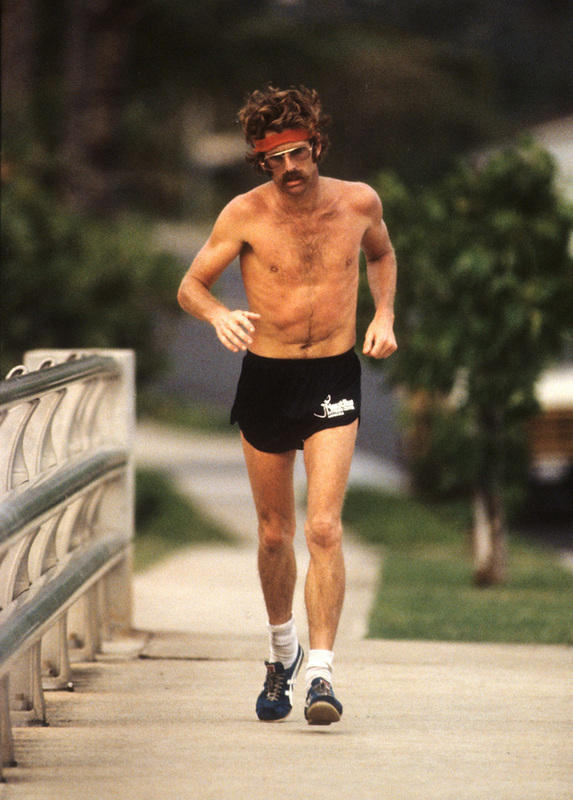 Good runners blanch when he passes them, as if to say, "If I can't beat that, I quit." whispered to a spectator, "I don't think he's going to make it." Four miles behind, Dunbar's handlers were goading their charge with this message: Warren is cracking up. Keep going. Keep going. Faerber had no way of knowing that the splay-footed runner laboring beside him did not have a high pain threshold, but simply no threshold at all. Warren listened impassively to Faerber's advice. He had decided to win the Iron Man contest, and so he slogged on, measuring his stride against a series of dotted highway markers. The pain in his leg was a reverberating drum. All day long he had eaten only an orange and a roll. He would go the distance. Suddenly, Gordon Haller loomed up ahead in the distance. Warren's route had doubled back on itself toward Honolulu and the finish line in Kapiolani Park. Almost nine miles behind the leader. Haller had stopped to take a drink. His handlers surrounded him. Warren speeded up significantly, his stride lengthened and his head was held upright. Upon seeing him, Haller was incredulous at the apparent absence of pain. He was getting a competitor's view of Warren's face for the first time in nine hours. Examining the race leader's composed features, Haller felt as if he had been shot. In the next hour Dunbar came to feel the same way. In his final Iron Man contest he would be a loser. Ahead a triumphant Tom Warren was approaching the finish line with renewed vigor. A light rain fell, and his pickup crew sprinted with him, along with a group of laughing teenagers. He completed the marathon in 3:51. About 20 people were waiting at the finish. It had taken him 11 hours, 15 minutes and 56 seconds to become the Iron Man, a day's work for a lifetime reward. The scene was reminiscent of The Rime of the Ancient Mariner when the character Life-in-Death shouts, "The game is done! I've won. I've won!" For every time Warren wins, he is cursed to try again. That is why he cried as a young boy by the family swimming pool. With thirst unslaked, this albatross around his neck, he sails on and on. Tom Warren lay on the grass and talked as onlookers stood in awe. When he tried to rise he held out a shaky arm and a slight man in his late 60s pulled him to his feet. A little later there was a minor commotion. Cowman was jogging by, just starting the first phase of the marathon. He had taken almost 2 1/2 hours in the ocean and just under nine hours on his bike. His real name is Ken Shirk. When he works, it is in construction, usually in Lake Tahoe. As he passed he let out a weird, loud yodel. Of the 15 entries, 12 finished. A Naval physician from San Diego, Frank Day, wrenched his knee in the swim and had to quit midway in the marathon. 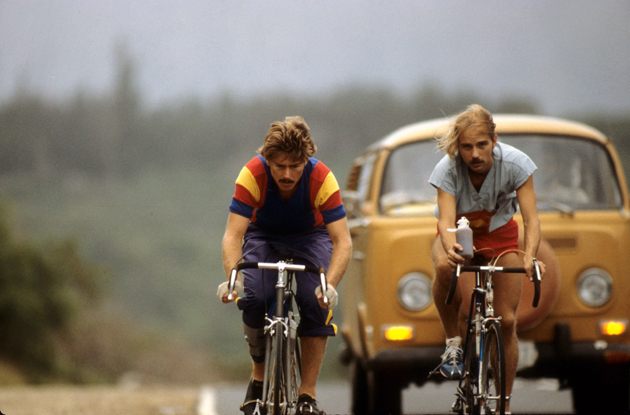 And two youngsters, Dave Heffernan and Dennis Cahill, had assorted mishaps and retired from their agony in the run. Emberson was third in 12 hours and 23 minutes. Haller needed 12:31, strengthening as the day progressed and as he got farther from the debacle of the swim. His marathon time was fastest of the group, eight minutes faster than Warren's. Lyn Lemaire finished fifth overall in 12:55. She ran hard at the finish. Henry Forrest improved his overall time by 35 minutes, sir. Cowman finished in 16 hours and 41 minutes, his horns in place. Warren was waiting when Dunbar crossed in second place. This was the real awards ceremony. Dunbar's numbed eyes widened when he saw the winner, now recovered in the 48 minutes he had put between them. The youngster's knees buckled and his body weaved a swaying dance. He was mumbling thickly, offering his congratulations. Warren quipped, "Ready to go bar-hopping?" But the dazed Dunbar was rushed off and wrapped in blankets. For a brief time his legs were paralyzed. While Dunbar's handlers gently poured warm water over him, Haller, the deposed champion, and Warren, the new one, went off together and sat in a Jacuzzi, swapping training stories until midnight. It was, they agreed, a way of life. In another room, Hank Grundman and six others who had served on various support crews dozed in exhaustion. After two hours Warren emerged from the Jacuzzi. Later he tried to talk someone into breakfast, but there was no one still strong enough to lift a fork, so at 1:30 a.m. the new champion walked in the rain down a deserted Honolulu street. He was wearing a T shirt and shorts. A couple of miles away, Commander John Collins stood sentinel in the park, waiting for his son, Mike, still running early in his marathon. The youngster would finish at 8:30 a.m. Monday. Tom Warren shuffled down the street unnoticed, hands in pockets and head bent under the rain, moving back middle age another day, going the distance, cursed to win so that he will not lose, the bright-eyed Mariner, all alone, alone on a wide, wide sea. 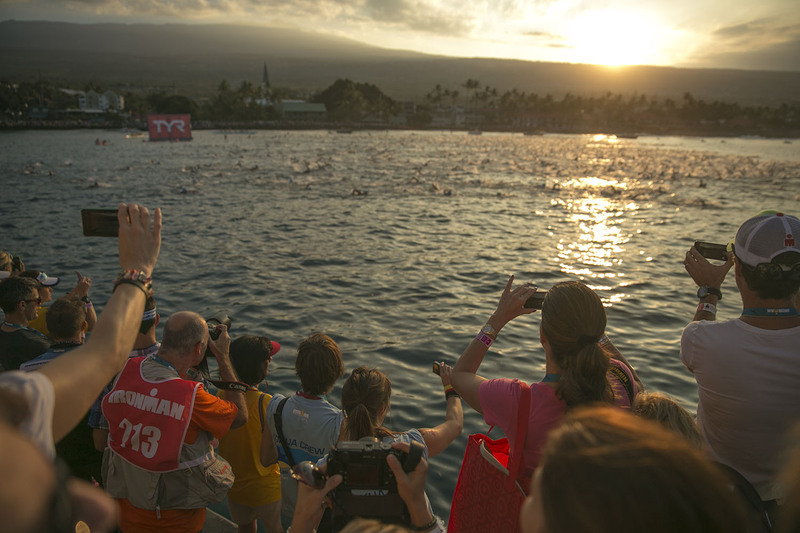 The sun rises over Mauna at the start of the IRONMAN World Championship. Onlookers watch the swimmers at the start of the race. 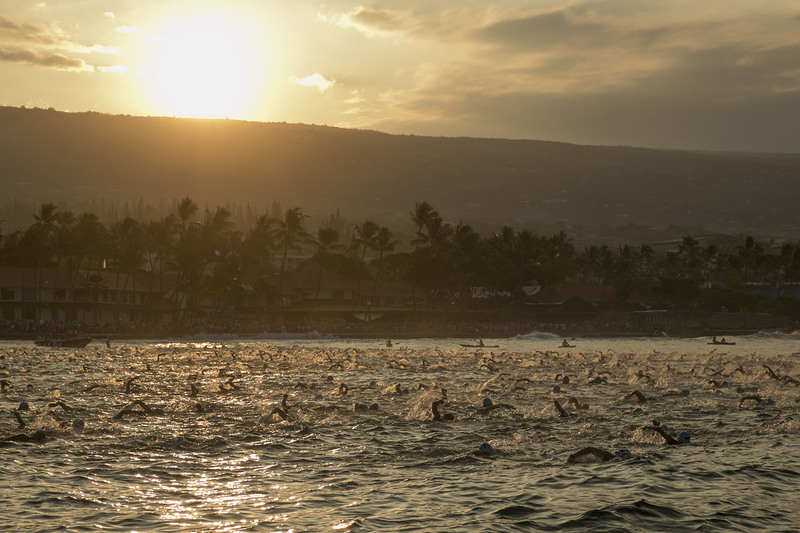 Swimmers are seen at dawn in the 2014 IRONMAN World Championship on Saturday, Oct. 11, 2014 in Kailua Kona, Hawaii. 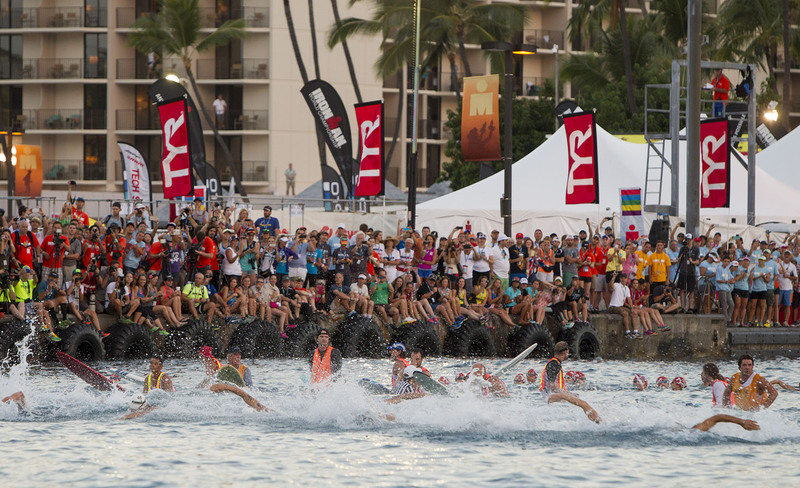 Swimmers are seen at the start of the 2014 IRONMAN World Championship. 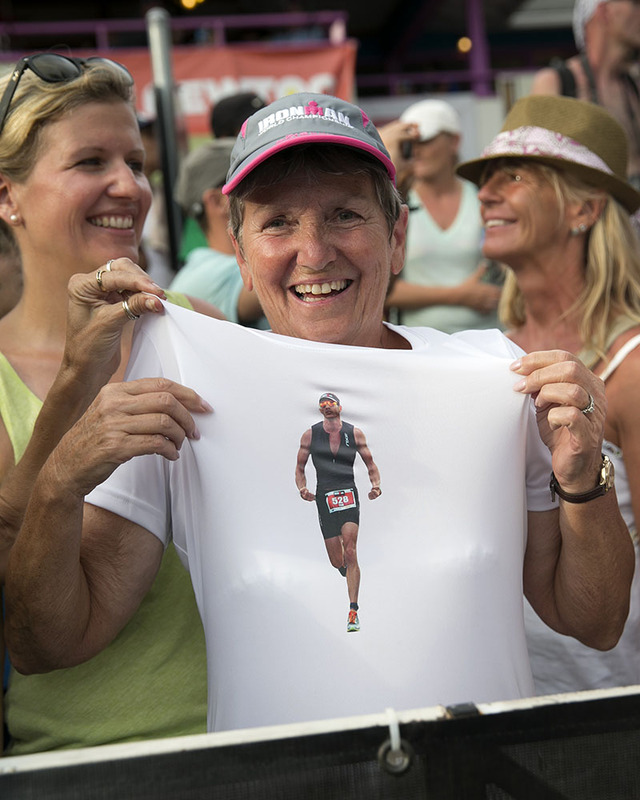 A race official places a body number on athlete Mike Avadikian before the start of the 2014 IRONMAN World Championship. A fan wears a shirt of athlete David Arnold. 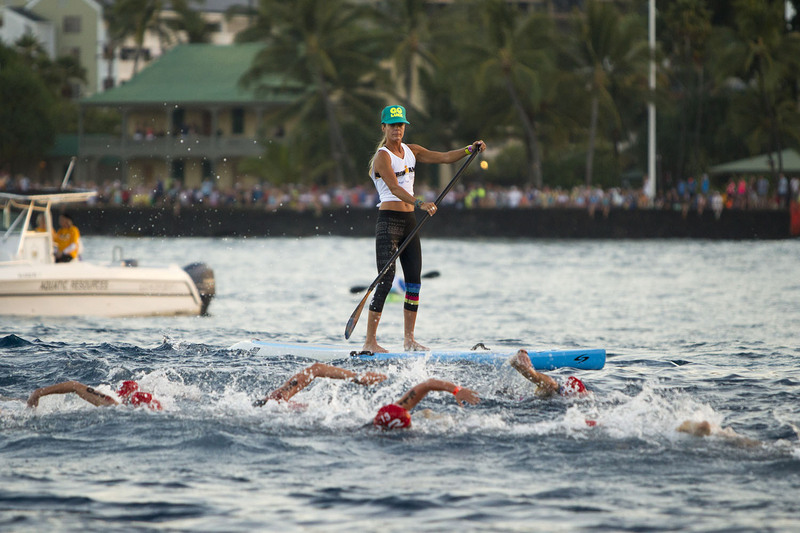 A paddle boarder watches over swimmers during the start of the 2014 IRONMAN World Championship. 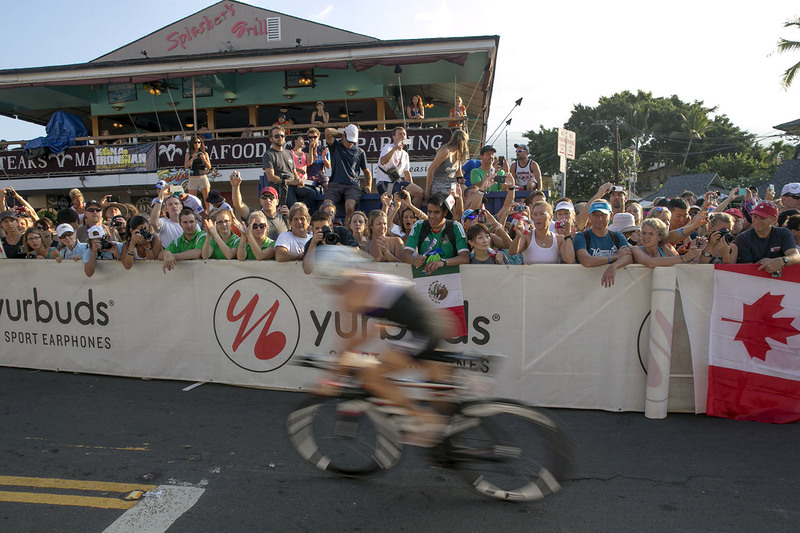 Onlookers watch bicyclist at the start of the 112-mile bike race of the 2014 IRONMAN World Championship. 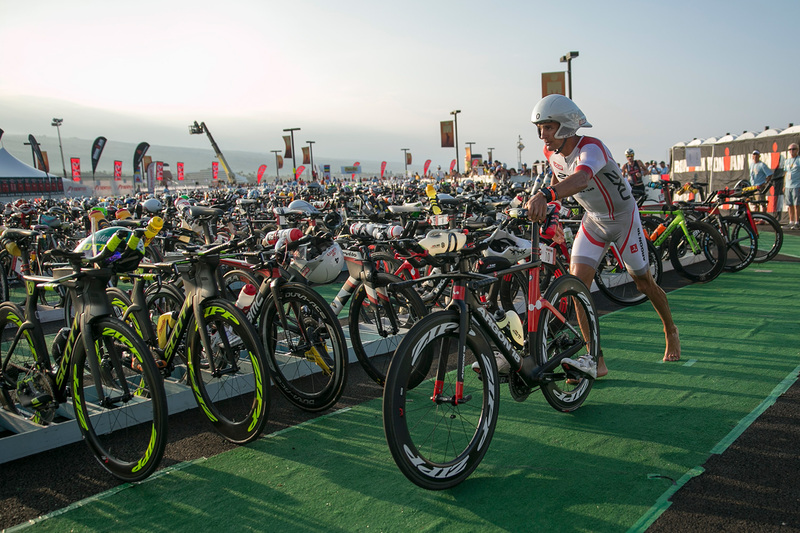 Terenzo Bozzone takes his bike out of the transition area before the start of the 112-mile bike race. Age group racers hit the road during the 112-mile bike race. 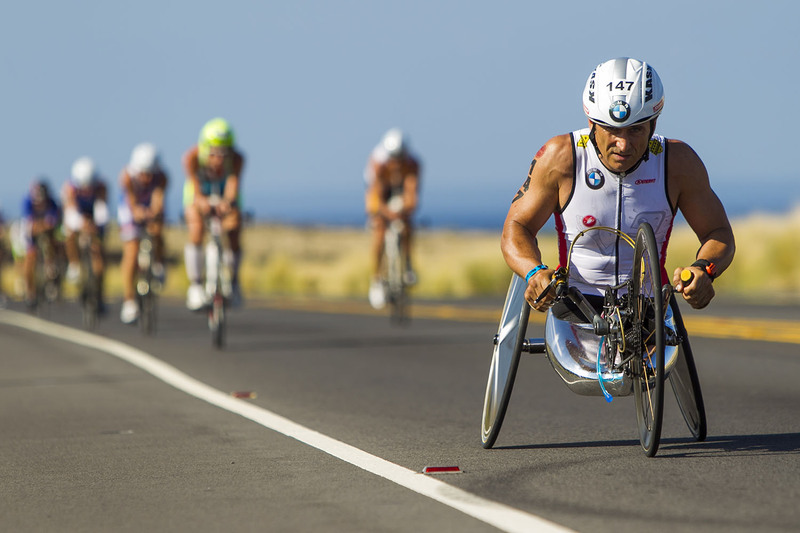 Paralympic handcycle champion Alex Zanardi leads a pack of racers during the 112-mile bike portion at the 2014 IRONMAN World Championship. Leanda Cave zooms down the road during the 112-mile bike race. 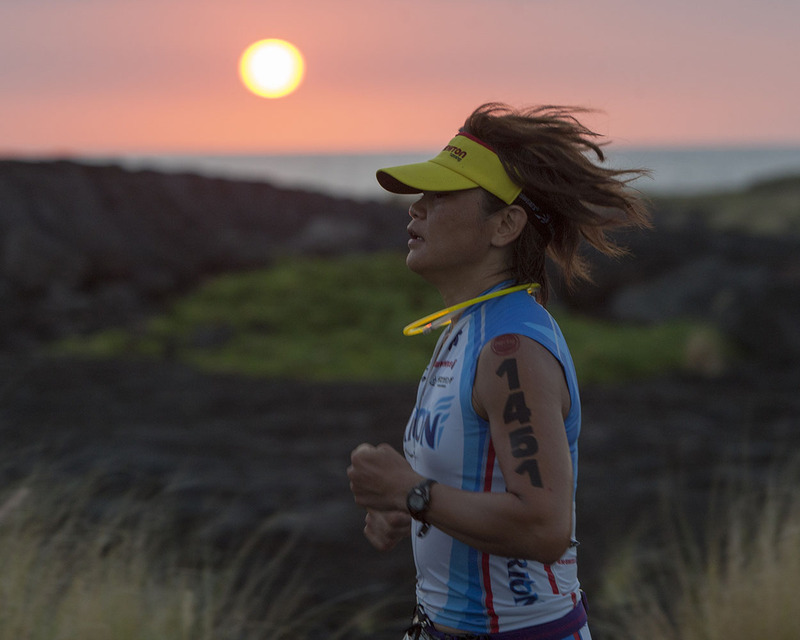 As the sun sets, Kaoru Suzuki runs the marathon during the 2014 IRONMAN World Championship. 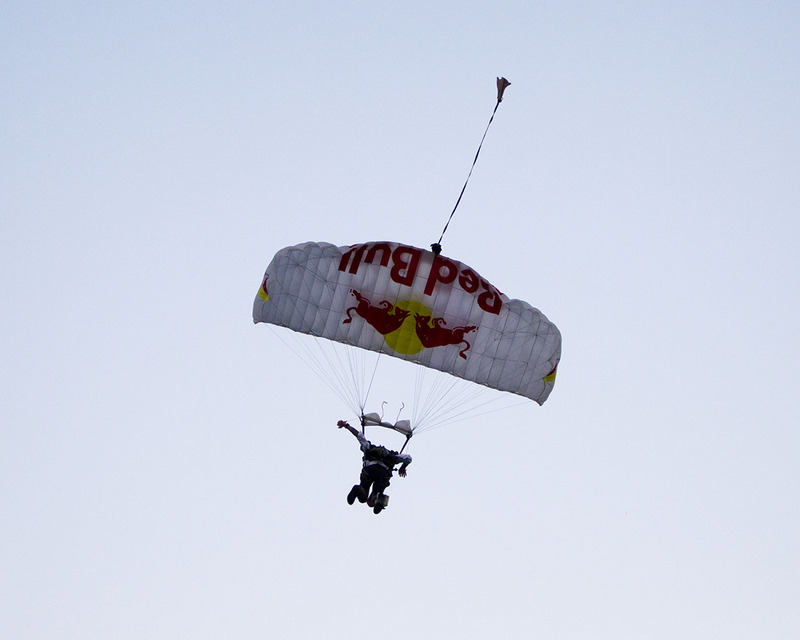 A Red Bull parachute team member jumps into the ocean before the start of the 2014 IRONMAN World Championship. 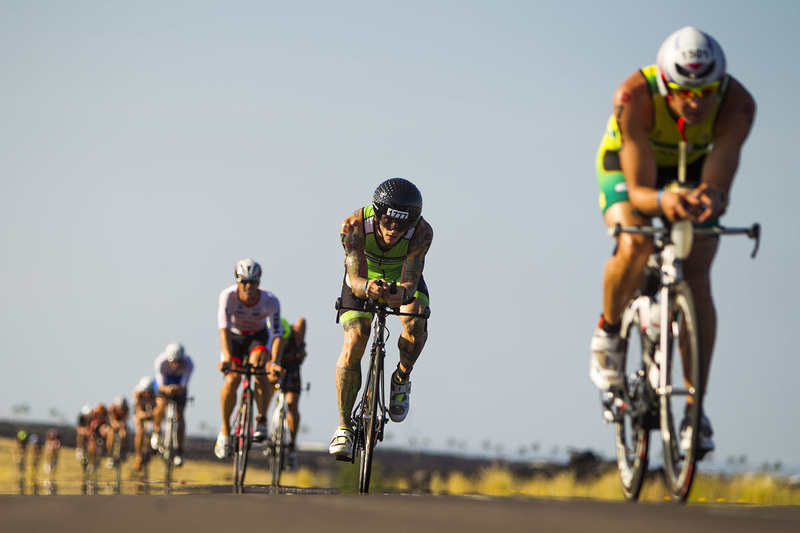 Athletes zoom down the road during the 112-mile bike race. 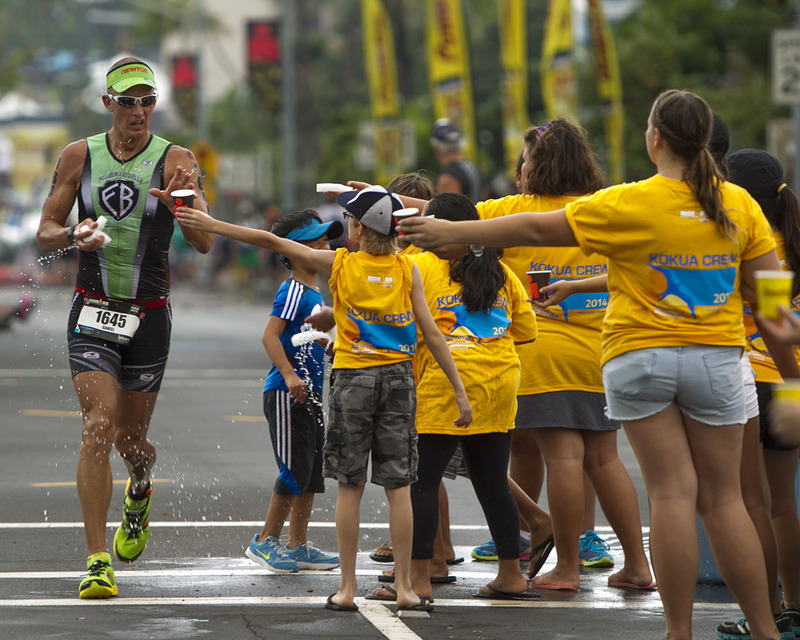 Daniel Stubleski grabs water from an aid station during the marathon portion of the 2014 IRONMAN World Championship. 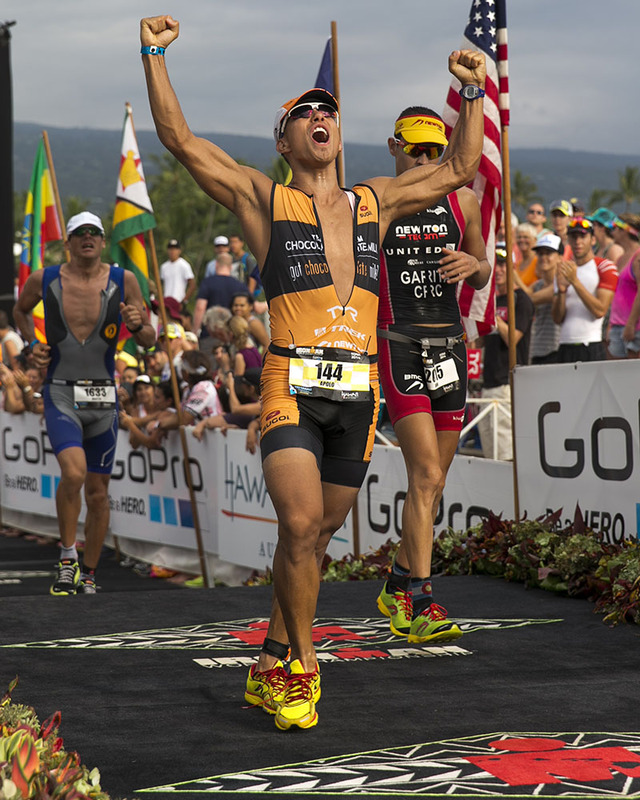 Former Olympian Apollo Ohno crosses the finish line at the 2014 IRONMAN World Championship. 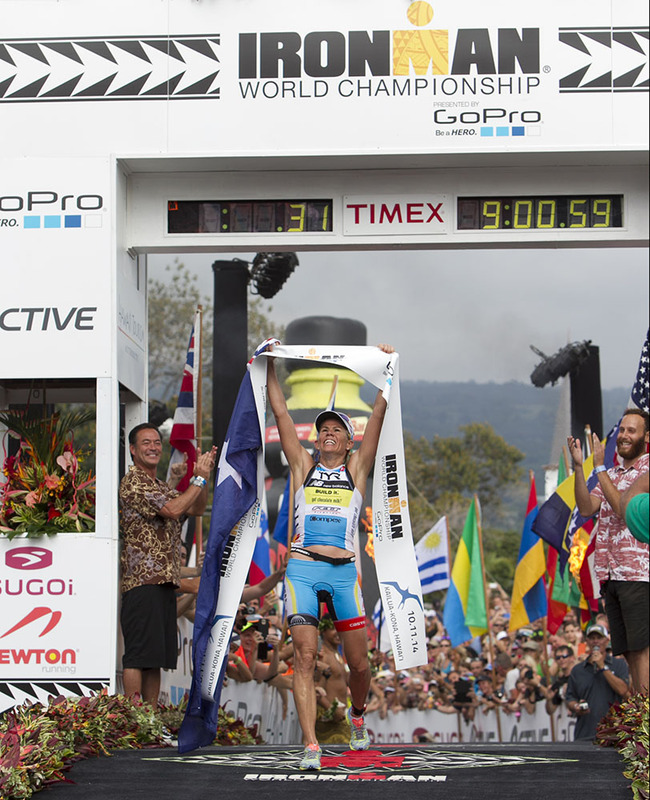 Mirinda Carfrae wins the woman's 2014 IRONMAN World Championship title. 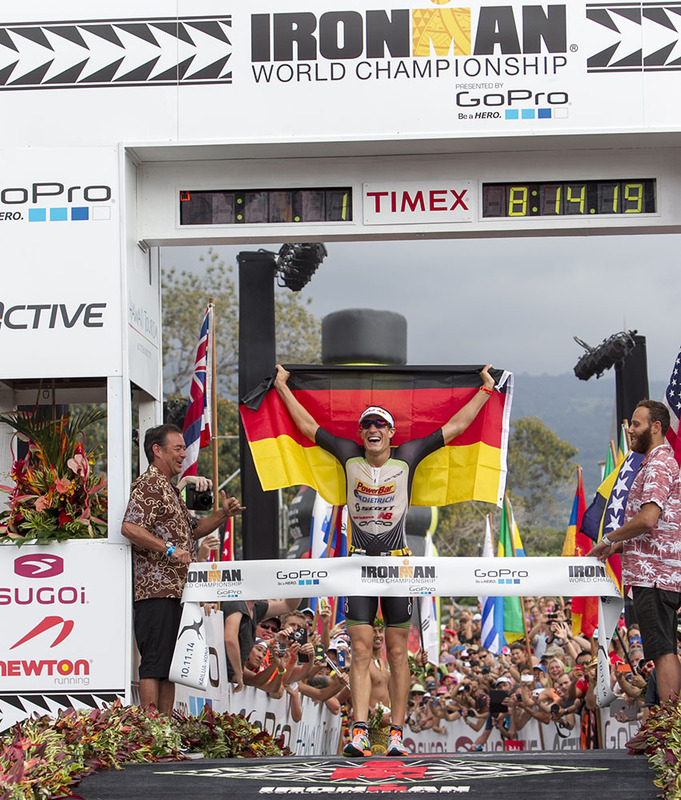 Sebastian Kienle wins the men's 2014 IRONMAN World Championship title. 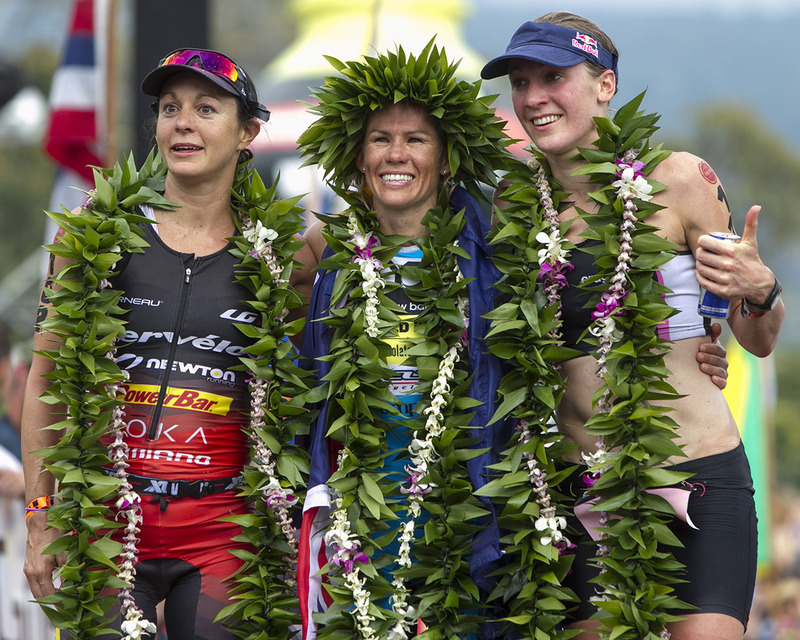 (Left to right) Rachel Joyce, Mirinda Carfrae and Daniela Ryf are seen at the finish line during the 2014 IRONMAN World Championship. 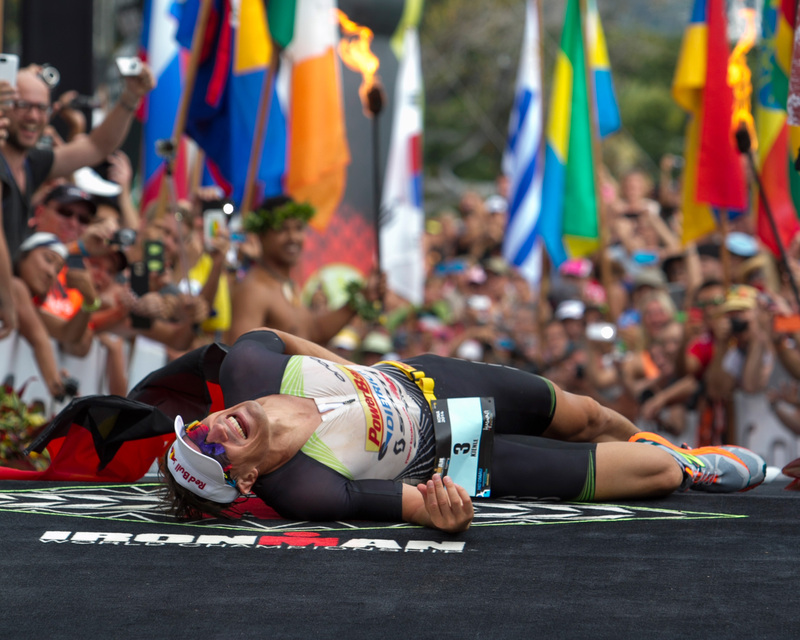 Sebastian Kienle reacts after winning the men's 2014 IRONMAN World Championship. 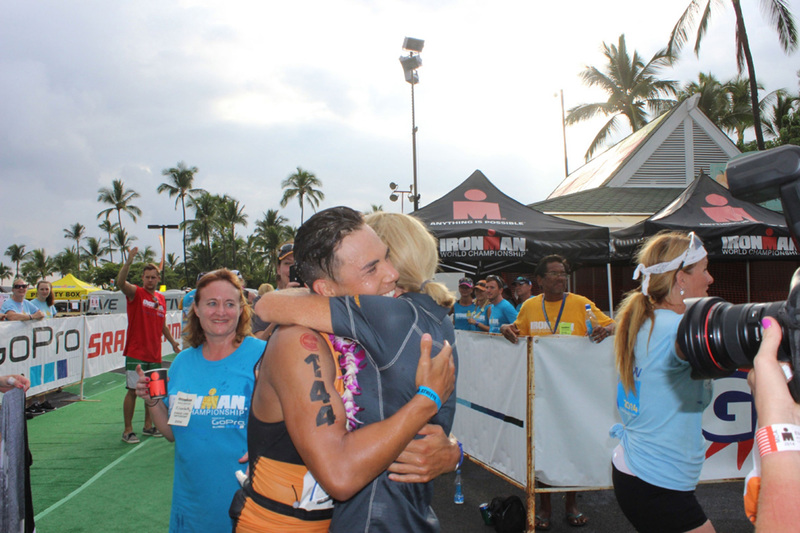 Apolo Ohno hugs coach Paula Newby Fraser after finishing the Ironman World Championship triathlon Saturday, Oct. 11 in Kailua-Kona, Hawaii. 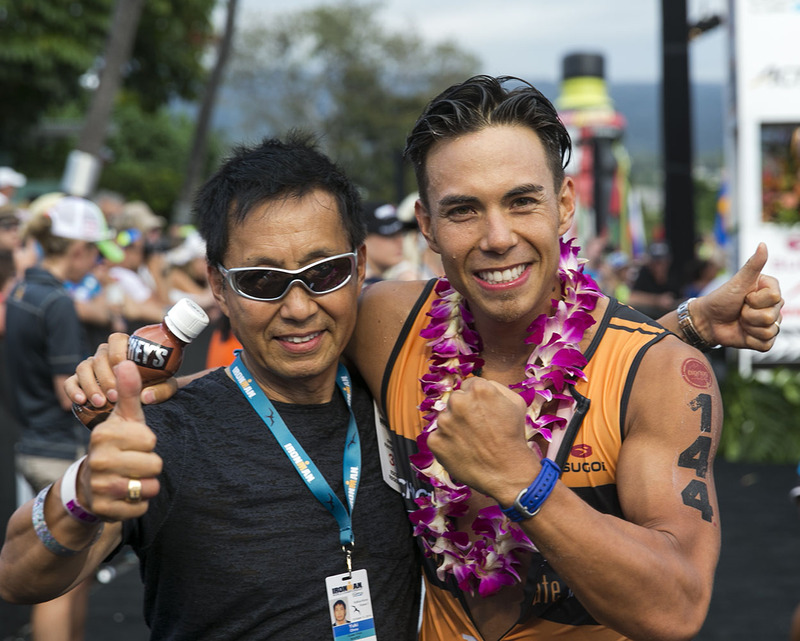 Former Olympian Apollo Ohno, right, poses with his father, Yuki Ohno after Apollo finished the 2014 IRONMAN World Championship.